The Cora Ball is a device that catches microfibres from clothes in your washing machine, preventing these fibres from entering into waterways. The Cora Ball takes its name and design from the corals in our oceans – like coral, it catches tiny particles that float around in the water. The device is designed to be placed in your washing machine along with your clothes, and as the cleaning process is carried out, it collects the tiny microfibres that are released from your clothes as they are washed. In doing so, it prevents these fibres from being released into our waterways. In fact, the company estimates that if one in ten US households used a Cora Ball, the equivalent of 30,000 plastic bottles would be blocked from entering the ocean. Independent testing estimates that the Cora Ball can catch 26% of the microfibres that would otherwise wash out the drain – per wash. After a few washes, users can just pull the fibres out of the ball, much like cleaning a hairbrush or removing the lint from a clothes dryer. The company is currently experimenting with ways to repurpose the collected fibres, but due to the mixed nature of the fibres, this is a challenge. The ball is 3D printed from 100% recycled material, and can also be recycled at the end of it’s useful life. The flexible yet durable material was selected because its properties can withstand any temperature and conditions found in residential and commercial washers and dryers. 75-95% of microplastics in the ocean are estimated to originate from textiles fibres, with potentially damaging effects throughout the marine ecosystem. In 2015 alone, 500,000 tonnes of microfibres were estimated to have been released into the oceans from washing clothes and textiles, particularly from synthetic, plastic-based textiles like polyester and nylon. The Cora Ball is a simple solution for households to cut their contribution to the microfibre issue. Microplastics can be ingested by marine life at various stages of the food chain, with potentially damaging biological consequences for wildlife who may be exposed to chemicals in the fibres. 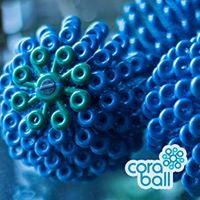 Cora Balls help to protect the ocean environment by catching microfibres. The Rozalia Project is a non-profit organisation aiming to improve marine health and reduce pollution through education, research and clean-ups.